Maybe you’ve heard of “whisker stress” (aka “whisker fatigue”) in cats. While it may have an odd sounding name, whisker stress is a real thing and not just some made-up malady to give us cat owners one more thing to worry about. So, what is it? A cat eating with its whiskers rubbing the side of the bowl. Some cats are fine with this, but for others this can cause “whisker stress” and they benefit from a differently designed cat bowl. Whisker stress is when a cat’s whiskers become overly stimulated by touching the sides of their bowls when they eat or drink. Some cats don’t seem to mind their whiskers touching their bowl, and for them whisker stress isn’t an issue. For other cats, though, eating or drinking out of certain bowls is a very unnerving experience. Whiskers, remember, are extremely sensitive to the slightest sense of touch. Even subtle movements in the air around them are felt by a cat’s whiskers. To learn more about cat whiskers you can see this page: Oh, Those Wonderful Cat Whiskers. Whisker stress has several common signs in cats. A classic sign of whisker stress during eating is when a cat uses their paw to scoop food out of their bowl and onto the floor to eat it. This behavior allows them to eat without rubbing their whiskers against the sides of their food bowl. 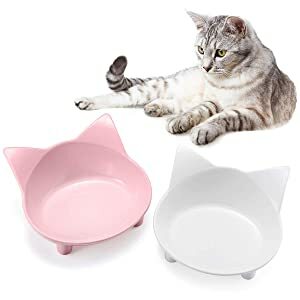 Other cats might walk unhappily around their food bowl or sit beside it, acting like they’re hungry but refusing to eat, or even meowing unhappily. If your cat’s food bowls are narrower at the bottom than at the top, a cat with whisker stress might quietly eat the first layers of food until they get down to the lower, narrower part of the bowl, then exhibit signs of whisker stress. Or, they might just walk off and never eat the food in the bottom layers of the bowl. 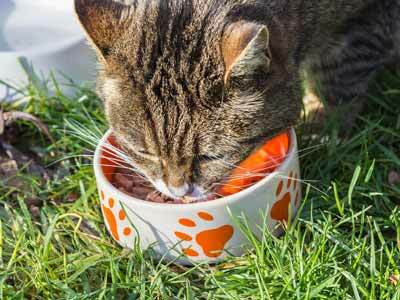 If your cat acts like whisker stress is an issue when they’re eating, take a look at their water bowl, too: If it’s the same size or shape as their food bowl they’re probably experiencing whisker stress when drinking, too. If your cat is showing any of the signs above, consider getting them wider and/or shallower bowls. 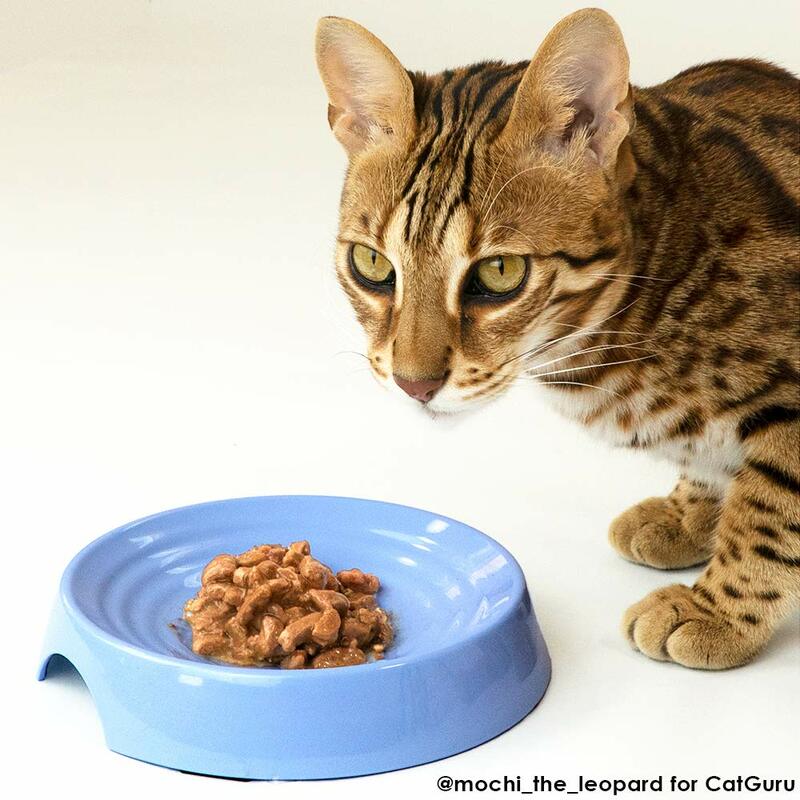 Some bowls are even marketed as “whisker relief” or “whisker friendly” bowls. Choose a bowl that is wide and/or shallow enough that your cat’s whiskers won’t touch the sides when eating or drinking. Remember, not all cats experience whisker stress. Or, you might already happen to have food and water bowls that don’t overly stimulate their whiskers. However, if you suspect your cat is experiencing whisker stress, a properly designed bowl will help make simple tasks such as eating and drinking a lot less unnerving and stressful for them. Some years ago here at SpecialCat.com, before we had ever heard of whisker stress, we had a cat that always scooped his food out of his bowl and onto the floor before he would eat it. From other indications we knew that he had extremely sensitive whiskers, but didn’t realize at the time that his eating behavior was probably related to his sensitivity. We just thought he was weird. Adorable, but weird. It was all kind of funny and cute until we adopted another cat who, at first, ate from the bowl just fine. But after a brief period of watching the first cat scoop his food onto the floor our new cat began to mimic the first one, and then we had two cats scooping food onto the kitchen floor. That was twice the mess which made the behavior only half as cute. The second cat was younger than the first one, and he was totally enamored of the older cat. He loved to watch him, hang out with him, and pretty much mimic him in everything he did. So, while the second cat could have been experiencing whisker stress, too, we’ve always been suspicious that he learned to scoop his food onto the floor simply from observing the first cat. So, if you have a cat showing signs of whisker stress you might want to try different, whisker friendly bowls sooner rather than later before scooping food onto the floor becomes learned behavior for other cats in the home regardless of the bowl being used.